Avonmouth bridge on the M5 motorway near Bristol, UK, is heavily trafficked and the deck of its steel central and anchor spans – to quote the Highways Agency (HA) – 'displays significant movement'. Nynas Endura N5 is a highly modified elastomeric bitumen binder for mastic asphalts where exceptional resistance to permanent deformation and cracking is required. It is a versatile binder that provides premium performance in challenging circumstances. Avonmouth bridge on the M5 motorway near Bristol, UK, is heavily trafficked and the deck of its steel central and anchor spans – to quote the Highways Agency (HA) – 'displays significant movement'. The crossing's asphalt surfacings have tended to wear out rapidly as a consequence, requiring frequent maintenance. The HA set out to find a surfacing that would perform well on the bridge deck for an extended period plus offer other benefits, including value for money. Aeschlimann International’s gussasphalt using Nynas Endura N5 binder. This surfacing provides long life even on flexible structures; it requires minimum intervention during the asphalt's life; resists water penetration; and offers early life skid resistance. Aeschlimann International believes its material with Nynas Endura N5 will last for many years on the Avonmouth bridge. That being so, the HA will get a very good return for its outlay. Surfacing on the Avonmouth bridge near Bristol has traditionally required major maintenance at relatively frequent intervals, due to the 'lively' nature of the massive steel structure's deck. The last time it was resurfaced was around the turn of the millennium. By 2006 it was clear that the crossing would soon need new asphalt. The UK Highways Agency scoured the world for a material that would perform well in difficult circumstances, that would last a long time and provide value for money. 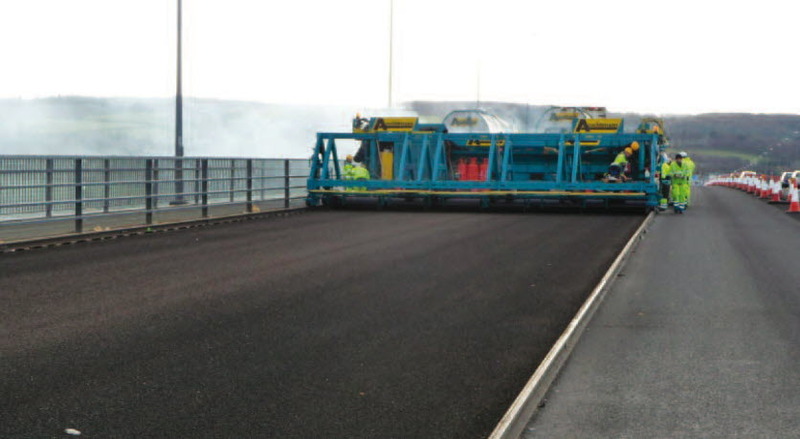 Among companies approached was Aeschlimann International in Switzerland, the asphalt specialist that, in collaboration with others, surfaced Europe's largest crossing, Denmark's Storebaelt bridge. Aeschlimann took up the Avonmouth bridge challenge: the material it used there is gussasphalt, or very dense mastic asphalt. Nominated supplier for the asphalt's binder was pan European bitumen specialist Nynas whose products and Swiss facilities are well known to Aeschlimann. The product used in the gussasphalt is Nynas Endura N5, one of the family of premium binders offered by Nynas. The Nynas Endura range provides ultimate levels of performance for any given application, ensuring toughness and the ability to resist the rigours of traffic loading. Its sustainability credentials are good, impacting relatively gently on the environment. Nynas Endura binders help produce asphalts that are workable and easy to lay; and that have extended lifetimes with the minimum of interventions during those lifetimes. Resurfacing of the Avonmouth bridge's southbound carriageway began in September 2008 and finished in January of 2009. Performance of the gussasphalt plus Nynas Endura N5 was monitored over the following spring and summer, with very high traffic levels experienced in the summer months. The asphalt having performed well, resurfacing of the northbound carriageway was begun after the 2009 summer season, with completion scheduled for December of that year. Exactly the same materials and application techniques were used in the northbound carriageway's resurfacing as had been employed with success in the southbound's resurfacing. The list of players involved in the Avonmouth bridge resurfacing project is complex. Ultimate client is the Highways Agency. Acting on its behalf is InterRoute, the joint venture of Mott MacDonald and Balfour Beatty Infrastructure Services which is service provider under the local (Area 2) EMAC (or enhanced managing agent contract). InterRoute placed a bridge deck waterproofing and resurfacing contract with Stirling Lloyd which formally appointed Aeschlimann International to carry out the asphalting. Aeschlimann chose Hanson operating out of its local Tytherington plant to produce the gussasphalt, which was designed and mixed to the Swiss company’s exacting specification, and subject to its quality control. The Aeschlimann mixes for Avonmouth were demanding ones, in terms of the temperatures required as well as complexity of ingredients. The gussaphalt mixture details have not been formally released but it is known that a blend of sands, a very high proportion of limestone filler and a number of additives – along with the Nynas Endura N5 binder – go into making the gussasphalt for the Avonmouth bridge's binder and wearing courses. Hanson had men dedicated solely to getting mixing and loading absolutely right. The material arrived on site in mobile hot boxes in which it could remain workable for up to 24 hours. The gussasphalt is viscous and spread rather than laid. Aeschlimann International's paving machine – or 'finisher', as it is called – is in reality a spreader, running on rails that are carefully positioned to achieve the correct thicknesses of asphalt, and ultimately 'levelled in' by eye to ensure appropriate contours. Such highly accurate pre-levelling (as opposed to levelling 'on the run' which occurs with conventional paving machines) plus the human touch has resulted in an exceptionally high ride quality for users of the Avonmouth bridge. Avonmouth bridge is the M5's most important crossing and carries in the region of 120,000 vehicles a day, high over the Avon. Given the new surfacing needs little maintenance and has a long life, motorists using the structure can look forward to many years of uninterrupted passage. Download this information on how Nynas Endura N5 was used at Avonmouth Bridge, Bristol, UK, as pdf.